Gleaming lusciously, just waiting for a fork. I’ve missed a few posts lately for my online bake-a-long group. Why? Life, really. A change of weather brought a never-ending headache with it, and when that finally went away (after a week! ), my insomnia went rampant and left me completely sleepless for a night. After 36 hours without a wink of sleep during the busiest time of year for my work, I crashed hard the next night…followed by a headache for a couple of days. Anyway, what with one thing and another, I missed posting. So this is a make-up post! A make-up post about what? 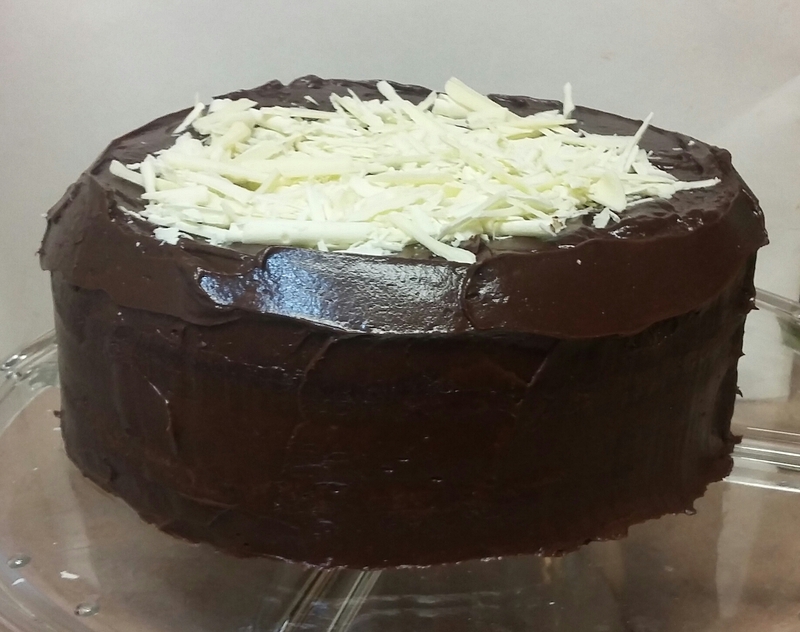 “Betty’s Chocoholic Cake“, from Dorie Greenspan’s Baking Chez Moi. 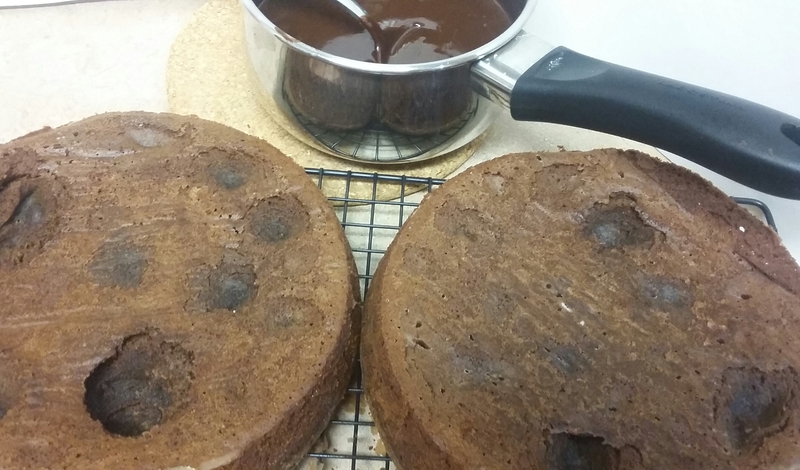 I looked at the picture that Dorie has in her cookbook and it looked a tad dry to me, but also super-duper chocolately and yummy! In order to eat a slice and not feel horribly unhealthy, my dinner tonight was made up of a kale smoothie. My lunch tomorrow? Kale salad. Me being me, I used chocolate chips from my local Bulk Barn as opposed to 65 % Valhrona chocolate, because my grocery bill is big enough without buying (admittedly delicious) high-end chocolate. Divots waiting to be filled with ganache. Eh, I thought, the ganache will cover that up! And indeed, it did. I topped the cake with shavings/curls from a bar of chocolate that I took a vegetable peeler to, and let it sit for about 30 seconds before taking a knife to it. But before that…. When I finished the cake, I proudly brought it to the DH’s man-cave, where he was working away on his computer. Me: Look, sweetheart! I made a fancy cake! DH: Who is that for? But enough witty banter (ha! ha! Banter! ha! *blows raspberry herself*), what was the verdict on the cake, you say? Oozing chocolate ganache. Actually, this is a desirable thing, wouldn’t you say? Not my fave. I’m very disappointed. Too dense, too much like a flourless chocolate cake (avec divots) and super-duper rich and (I hardly knew this was possible) too sweet. Just overall too much. I plan to stick it in the freezer and sloooooowly eat it over the next year. Yes, it’s that intense that a teeny, tiny slice will do ya. And this is me we’re talking about! Chocolate Queen herself! So sadly, whether it’s my substitutions or just my taste, I wouldn’t recommend it. What I’m actually craving? A kale smoothie. Mmm…I think I’ll have one for breakfast tomorrow! Next Post: Bread! Buns! Le pain! An odyssey. 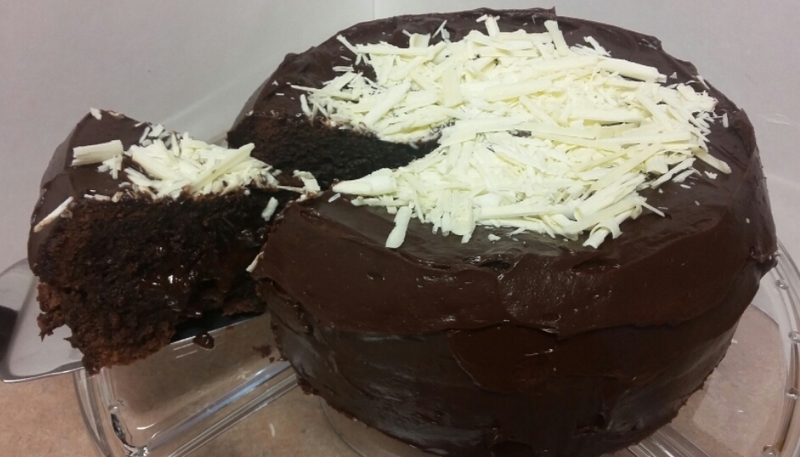 This entry was posted in Cakes, Cook-a-Longs R Us on June 1, 2016 by Margaret. I’m sorry this didn’t live up to your expectations, but at least you got an entertaining post out of it! Hope the headache woes are long gone.